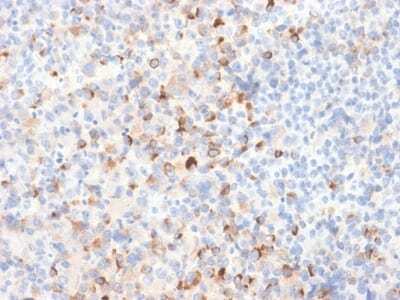 This antibody recognizes a cluster of proteins between 70-80 kDa, identified as tyrosinase, a useful marker for melanocytes and melanomas. SK-MEL-19, SK-MEL-30 cells or Melanoma. This antibody recognizes a cluster of proteins between 70-80 kDa, identified as tyrosinase. Occasionally a minor band at 55 kDa is also detected. 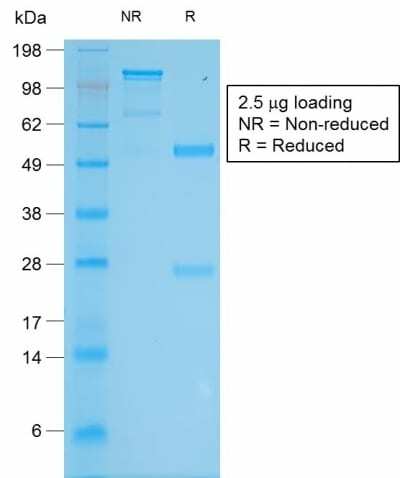 This MAb shows no cross-reaction with MAGE-1 and tyrosinase-related protein 1, TRP-1/gp75. Tyrosinase is a copper-containing metalloglycoprotein that catalyzes several steps in the melanin pigment biosynthetic pathway; the hydroxylation of tyrosine to L-3,4-dihydroxy-phenylalanine (dopa), and the subsequent oxidation of dopa to dopaquinone. Mutations of the tyrosinase gene occur in various forms of albinism. Tyrosinase is one of the targets for cytotoxic T-cell recognition in melanoma patients. Staining of melanomas with this MAb shows tyrosinase in melanotic as well as amelanotic variants. This MAb is a useful marker for melanocytes and melanomas. Catalog number key for antibody number 2024, Anti-Tyrosinase (TYR/2024R) The prefix indicates conjugation, followed by the antibody number and size suffix. Chen Y-T, et. al. Proc. Natl. Acad. Sci. USA, 1995, 92:8125-8129.